Joseph Lieberman: 7.2% GDP growth isn�t a recovery without job creation. Al Sharpton: Dean�s Confederate flag comment stereotypes Southern Whites. Carol Moseley-Braun: Continue to fight for gay rights. Carol Moseley-Braun: Get past the racist strategy that Republican foisted upon. Dennis Kucinich: Allow gays and lesbians to marry. Howard Dean: Stop being divided by race: reach out to white southerners. Howard Dean: Reach out to every American, even Southern white males. Howard Dean: Make no apologies for reaching out to poor Southern whites. Howard Dean: Gays deserve equal rights under the law. John Edwards: Most southerners don�t drive around with Confederate flags. John Kerry: For partnership rights and civil union. Joseph Lieberman: Sunset the Patriot Act. Wesley Clark: Equal opportunity for homosexuals in armed forces. Wesley Clark: �Don�t ask, don�t tell� needs to be reviewed. Wesley Clark: Gays deserve the same rights as everyone else. Joseph Lieberman: Broad-based sexual education is important. Dennis Kucinich: Affirm intention to work with the world community. Howard Dean: Let the UN handle the Iraq situation. John Edwards: Bring UN, allies and friends to Iraq. Wesley Clark: Embargoes don�t work in Cuba or other dictatorships. 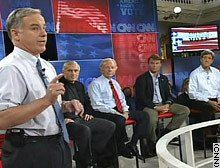 Howard Dean: Background checks for gun shows. John Kerry: Democratic Party shouldn�t be for the NRA. Al Sharpton: Submit to a world body to combat the terrorists. Carol Moseley-Braun: Leave the Iraqis the same as we found them. John Kerry: Make certain the veterans have benefits. Joseph Lieberman: Go back to the UN and negotiate about Iraq. Wesley Clark: Armed forces are better with a volunteer force. Al Sharpton: Spend $250 billion in 5 years to create jobs. Carol Moseley-Braun: AmeriCorps is important, as public service for young people. Dennis Kucinich: Cancel tax cuts for the rich. John Edwards: Help bring jobs to where they are most needed. The above quotations are from CNN "Rock The Vote" Democratic Debate (targeted at young voters), Faneuil Hall, Boston, Nov. 5, 2003.